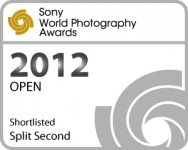 I managed to get runner-up in the “Split Second” category of the 2012 Sony World Photography Awards for my “eggsplosion” image. Maybe I’ll do a bit better in 2013? Previous PostPublished in National Geographic onlineNext PostA 56 Megapixel macromosaic of the underside of an Owl butterfly.